Amanda Berry Smith was born a slave in Maryland in 1837. She was freed when she was three years old. Her father, John Berry had bought himself and his family and then moved them to Pennsylvania. He made their home near an Underground Railroad station. Because of this, their property was closely watched to see if they were harboring fugitives. One night, slave trackers burst in, demanding to know where John had hidden a runaway. The men beat John and tried to stab Amanda’s mother. Another time they did catch a terrified fugitive who tried to escape by leaping form an upstairs window. The unfortunate man was dragged away in chains. On yet another occasion, one of Amanda’s free born sisters was sold into slavery while she was visiting an aunt in Maryland. Amanda had to borrow $50 to buy her back. Amanda certainly knew all about slavery, so when she experienced the freedom of salvation in Jesus Christ, she praised God for delivering her twice!! When she was seventeen years old she married Calvin Devine. They lived in New York City where Amanda worked as a domestic servant. This was in 1856. When the war started, he went away to fight but never returned. Amanda had a strong desire to tell others about Christ and thought that she would get a better chance if she married a man who was a deacon. It turned out to be a bad choice. He lied to her about his plans for his life, and eventually abandoned her. Now she was a widow with small children to care for. She worked long hours and starved herself so that the children might eat. This suffering taught her to depend on God for everything in her life. Sadly, all but one of her children died in infancy, the result of living in cold, damp rooms while Amanda toiled as a laundress to earn a pittance to care for them. Though she had these any troubles in her life, she did not allow Satan to stop her from where she believed God was calling her. During the 1860’s, a wave of Methodist evangelism that featured a revival movement that urged Christians to experience the “second blessing” swept through the country. This “second blessing” was described as a special empowerment by the Holy Spirit to live a deeper, holier life. Amanda attended one of the revival meetings and prayed for this movement by the Holy Spirit in her own life. Waves of joy flooded her as she felt the sanctifying power of the Spirit. She was the only black person in the church, and normally shy, but this did not prevent her from shouting aloud with joy. Now she knew that she was called to be an evangelist. In 1869 she tried her hand at preaching. By 1870, evangelism was her full time profession. She was very popular, becoming known as far north as Maine and as far sough as Tennessee. She was constantly called on to preach at camp meetings, churches, and other gatherings. Dressed plainly in black, white, and gray, she began speaking in African Methodist Episcopal (AME) churches. She had a rich contralto voice and sang stirring songs in addition to giving her testimony of how Christ had delivered her. She urged her listeners to seek and find the same joy that she experienced. This self-educated ex-slave eventually won souls on five continents and challenged all Christians wherever she went to live lives that were consistent with their Christian testimony. She became the first black woman to work as an international evangelist in 1878.Through her example, women gained a more prominent role in the AME Church. She served overseas for the next twelve years in England, Ireland, Scotland, Africa, and India. In Africa, she worked for eight years as a missionary in Liberia and West Africa, where revival broke out. “The people came from all directions,” she said. “We went on for two weeks without a break. We had several all-night meetings. . . . some old men were converted that were never known to pray or be serous before.” Amanda was one of the A.M.E. Church’s most effective missionaries and hailed as one of the most remarkable preachers ever known. In 1892, she returned to the United States and settled in Harvey, Illinois. Amanda was fifty-five years old. Old age and ill health did not make her stop. 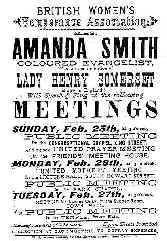 She continued to evangelize, and began writing her life story, entitled An Autobiography: The Story of the Lord’s Dealings with Mrs. Amanda Smith, the Colored Evangelist, which was published in 1893. Amanda was motivated to write her autobiography in order to raise money for her latest mission: a home in Chicago for black orphans. 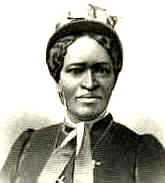 She also published a small newspaper entitled Helper to publicize and support her cause – “For the Care, Education and Industrial Training of Orphan, Destitute, Needy Children, and especially those of colored parentage.” Amanda also returned to her singing and preaching in churches, both black and white, to raise money for the orphanage. In 1912, after so many years of public service, Amanda retired to Florida. The orphanage was taken over by the state of Illinois and chartered as the Amanda Smith Industrial School for Girls. She died in 1915 of a paralytic stroke at the age of seventy-eight. Her autobiography, full of the details of her homey wisdom and her struggles, has become a classic in women’s studies. Amanda’s example of courage and faith is truly remarkable. We can all be encouraged by her life to trust in God always, and lean on Him in every circumstance in our lives. She knew and she moved in faith. So will I! Glad you got this story. I’m interested in going to your blog now! I am interested in the book download where can I find that? Thanks. I do not know about a download, but her autobiography is called, “An Autobiography. The Story of the Lord’s Dealings With Mrs. Amanda Smith”. I purchased a facsimile on Amazon.com. You can also get information about her in “Great Women in Christian History”, Dr. Kenneth Curtis.In this book Dr. Curtis tells the stories of 37 amazing women who changed their world. I highly recommend this book. She did and I will! Thank you for reading the story, Jewell. Amanda was such a remarkable woman; her story needs to be read by all.